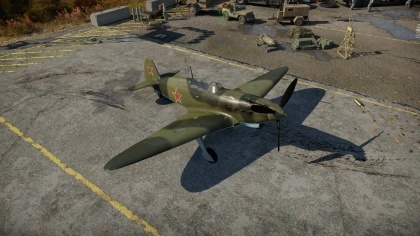 The Yak-7B is a rank II Russian fighter with a battle rating of 3.3 (AB), 2.3 (RB), and 2.7 (SB). 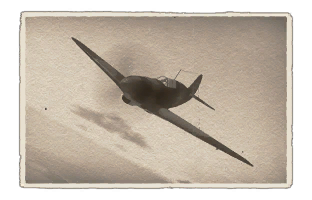 This aircraft has been in the game since the start of the Open Beta Test prior to Update 1.29.
? ? 9 900 ??.? ??.? ??.? ??.? ??? Like most Soviet planes, performance at high altitude leaves much to be wanted. The Yakovlev Yak-7 was originally intended as a two-seat trainer version of the Yak-1 fighter plane for the Soviet Air Force and only armed with 1 7.62 mm ShKAS MG for gunnery practice. Eventually, engineers at the Yakovlev Design Bureau modified the plane into a single-seat fighter superior to the Yak-1. The plane was armed with a single, propeller-mounted 20 mm ShVAK autocannon and 2 ShKAS machine guns in the engine cowling and included armor for the cockpit. The plane was quickly adopted by the air force and production was approved by late 1941. Unfortunately, Operation Barbarossa, the German invasion of the USSR had already begun and the relocation of factories to the Urals and more pressing needs elsewhere meant only 65 were available at the end of the year. Though it would see service as a fighter and interceptor, the aircraft was more often used as a fighter-bomber due to its ability to carry bombs and rockets for use against the Nazi and Italian ground forces. The Yak-7B would be introduced in 1942 and had a reduced wingspan, improved on-board systems, and an easier-to-produce undercarriage compared to the Yak-7A. Production of the Yak-7B would amount to over 5,000 aircraft produced. It would later see service with Albania, Bulgaria, Hungary, Mongolia, Poland, and Yugoslavia, which only received 2 Yak-7V planes. The Free French Air Force Normandie-Niemen squadron would also employ the plane on the Eastern Front, eager to get revenge against the Luftwaffe that had bested them on the home front. This page was last edited on 7 April 2019, at 11:31.